This Instructable will teach you how to create a great sounding BoomBox that can be powered with most any mp3 player or laptop. I spent less than $60.00 on this project because I already had a few of the parts in my studio. This project requires very few tools and very little electrical knowledge, perfect for beginners or those who want a "cheap" speaker set-up. 1. A power amplifier. I used a Lepai LP-2020A+ for this project It is sold for less than $20 and can be found here. It comes with a wall plug for home use. 2. Speakers. I used these 2 channel speakers at 87db. If you shop around you can find some great deals, and if you can spend a little extra, I recommend going to a higher efficiency speaker rated at 92-93db. 3. A housing for your BoomBox. I used an old camera case that I had in my studio. You can find fun and unique cases to hold your electronics, I suggest checking thrift shops or asking older relatives. Remember that it needs to be somewhat sturdy and large enough to hold your speakers. I'm using 6 1/2" speakers on my case. 4. An mp3 player. I think it's safe to say that most of you already have one of these or tunes on your phone. The KA-BOOM BOX also works great for viewing movies from a laptop, which usually have little speakers to begin with. 5. A rechargeable 12 volt battery and charger. I purchased mine here. Again, shop around for deals. 6. A 2.5 x 5.5mm AC DC 12V Power Male Plug Adapter. Here is an example. 7. An 1/8" to 1/8" plug. 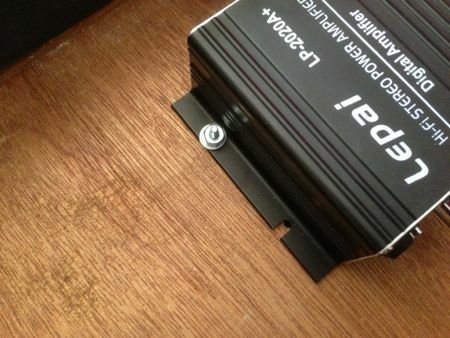 This plugs directly into the Lepai amp as does an RCA to 1/8" plug. Example. 1. Jigsaw for cutting your speaker holes. 2. Drill and bits for the screw holes. 3. Screws to attach your components to the case. These will vary based on the parts you choose to use. 5. Safety glasses. Always wear your safety glasses for protection. 1. Choose where you would like have your speakers. There are lots of options for this step, so choose wisely. 2. Mark your holes and drill a hole on the inside edge to allow your jigsaw to start cutting your speaker holes. 3. Attach the clips provided with your speakers that will secure them firmly to your case. Remember to rotate your speakers so they look good to you. 4. Connect the speaker wire to each speaker. Most speakers will come with these accessories but you may need longer lengths of wire depending on the size of your case. 5. Secure your speakers to the case. 1. Secure your amp in a great spot inside or out. I decided to place it inside which means that I have to open my case to adjust the sound. This is where you can be creative in your placement. One idea is to place the amp so that the knobs poke through your case for easy adjustment. This will certainly require additional work but can be very handy. I placed mine near the speakers and left enough room for my cords on the bottom. 2. Mark and drill the holes to hold your amp. The Lepai did not come with hardware to I ran to the hardware store and picked up 4 bolts, 4 nuts and 8 washers. Place the bolt heads on the outside of your case so that they do not scrape you when you travel. 3. Hook your speakers up to the amp. 4. Attach your choice of power supply. Battery or wall power. 5. Drill holes for your power cords to escape from the box in a convenient location. 6. Plug in your music, turn on the amp and you are ready to go. I'm happy to answer any questions you may have, so ask away. Anybody have a electronic drawing for me to understand the concept? It's not a boomcase, it's a Ka-Boom Box. Way cooler. I feel pretty good about the sound quality. It easily fills a large room or big yard full of sound without distorting. The bass response is pretty decent, as well. In the future I plan to use a higher db speaker rated at 93dbs. Thank you. I unplug my battery and charge it with the unit I purchased with my batteries. I get around 6 hours with a full charge.